The following information comes courtesy of http://www.beerpulse.com. (Escondido, CA) – In hopes that Stone Brewing Co. manages to escape the Cocos Fire unscathed, the company is planning a special release for the first week of June. 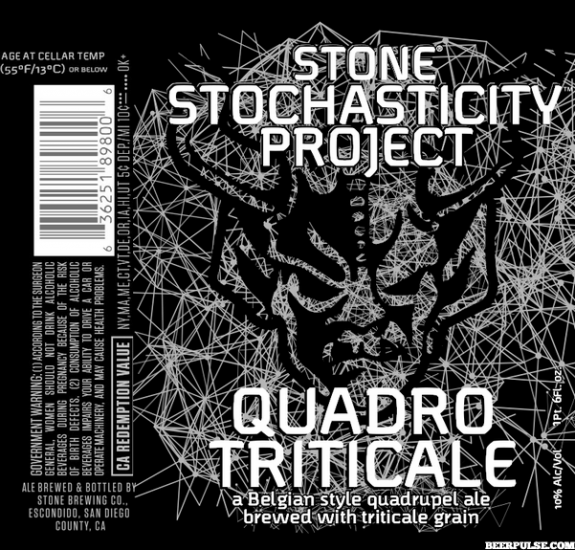 Stone Stochasticity Project Quadrotriticale slated for a June 2nd release. Below is some marketing copy on the beer. When testing the inherent makeup of the quadrupel—the warmest and darkest of Trappist monastery beer styles—we added triticale, a hybrid grain combining the pleasant flavor of wheat with the elemental durability of rye. We originally explored this nouveau twist on a traditional style in 2010, when brewing a test batch of a potential beer in our Stone Vertical Epic Ale series. Brewmaster Mitch Steele reached for and subsequently improved on that pilot recipe, bringing it to life as part of the Stone Stochasticity Project. The result is a quad that’s lower in sweetness, but rich with dried fruit and spice nuances. Border Hopfest releases list of breweries and beers!